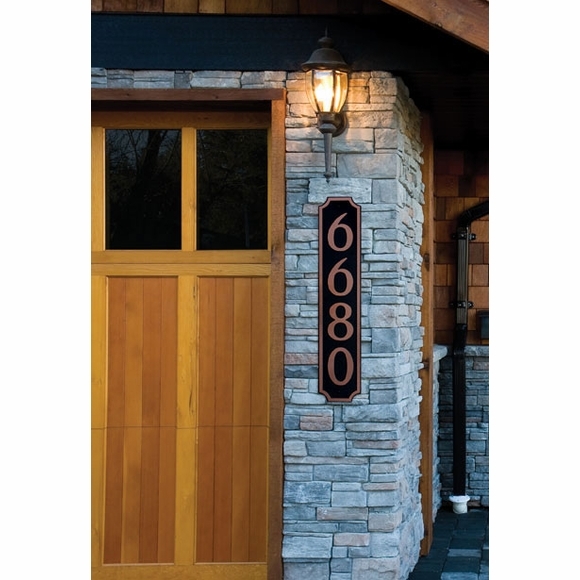 Personalized Vertical House Number Sign - - is made of maintenance-free composite plastic and is one of our less expensive personalized address plaques. Made in USA. Sizes: 4"W x 18"H and 6"W x 24"H.
These plaques hold up to 7 characters. The size of the characters varies from 1.75" to 4" on the 4x18 sign and from 2.5" to 4" on a 6x24 sign depending on the number of characters in your house number. The three numbers on the small images above correspond to the model numbers in the Select model drop-down box above. The 3-number addresses shown in the first five small images above correspond to the model numbers in the Select model drop-down box above. The M or L under the number is just a size designation. M size is the 4" x 18" model (our options 1, 3, 5, 7, and 9). L size is the 6" x 24" model (our options 2, 4, 6, 8, and A). The order turn-around time was quick, and the sign looks great. After putting it on the house we noticed the sign had expanded and bowed out when the sun was on it directly. We added some adhesive to the back of the sign, and that worked great. Very happy with the selection; just be aware that it is plastic and may expand if in a sunny spot. Excellent product for the price. Very attractive.